I must apologize for the long absence, its simply because a lot of things happened to be in my plate and I had to take them a piece at a time! I really missed sharing what I have been up to and I'm going to jump right at it! I did quite a lot of sets these passed months, from birthday to bridal and other occasional sets. And I most confess, I learnt a lot and enjoyed every bit of it. Here, I'm going to share two sets I made for a lady in Ireland!. She wanted something loud, and outstanding for her birthday. Something unique to go with her two outfits for the day. 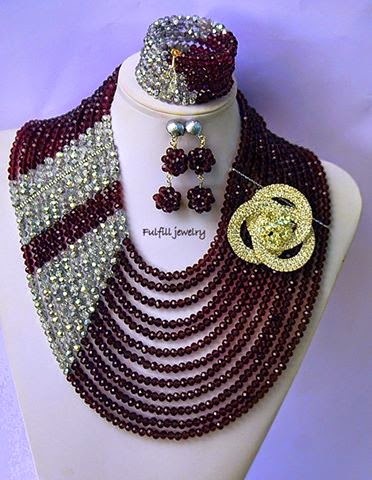 Her first outfit was purple gele with silver blouse and purple wrapper and of course, she wanted the beads in the same colours! 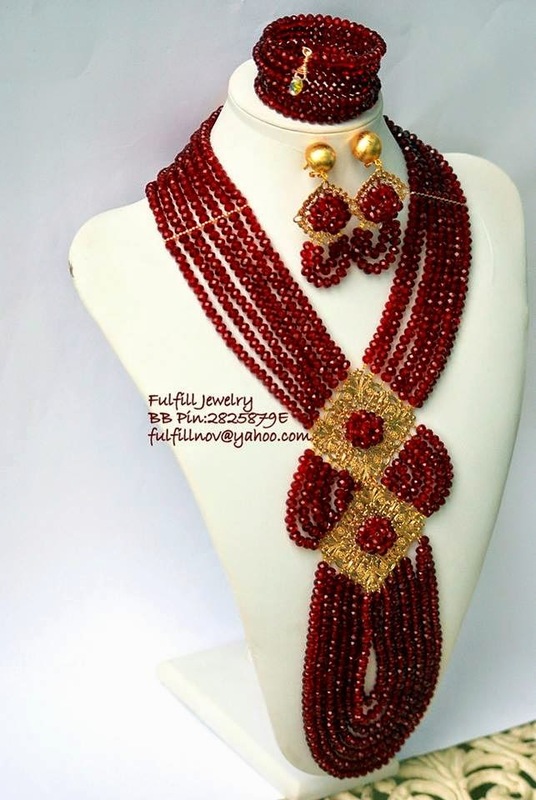 The second outfit was wine and gold with wine gele. It was really a big deal as she has not really celebrated in this magnitude. It was a special day as she was celebrating a huge milestone ( special age) in her life and wanted to look her best. I was excited and as usual nervous! I mean, she is in Ireland and I'm in Nigeria . So our only means of communicating was on the phone and texts messages. 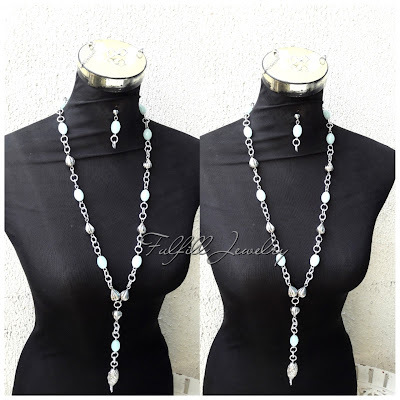 As usual, I took her along with every step during the making of the jewelries till I finished them. I must say, the wine and gold set was an eye opener and challenging! It took me a LOT of time and thinking but, I did pull through. The wine was a huge challenge but really glad with the outcome. Absolutely beautiful! You did a great job! !